5.11 Tactical Defender-Flex Lo-Pro/Lo-Vis Stretch-Denim Jeans and Defender-Flex Slim Cavalry Twill Pant Combat/Tactical Pants for Concealed Carry (CCW)! : High-Functioning Tactical Clothing Goes Hipster Chic (Video!) | DefenseReview.com (DR): An online tactical technology and military defense technology magazine with particular focus on the latest and greatest tactical firearms news (tactical gun news), tactical gear news and tactical shooting news. 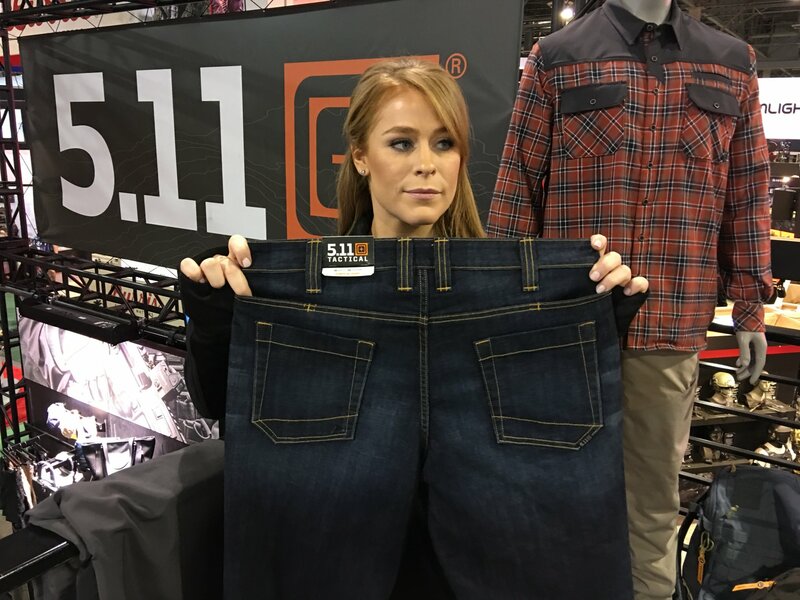 If you’re looking for some cool, comfortable denim jeans and for concealed carry (CCW), but you want to channel your inner hipster while you’re doing it, then 5.11 Tactical definitely has the product for you. 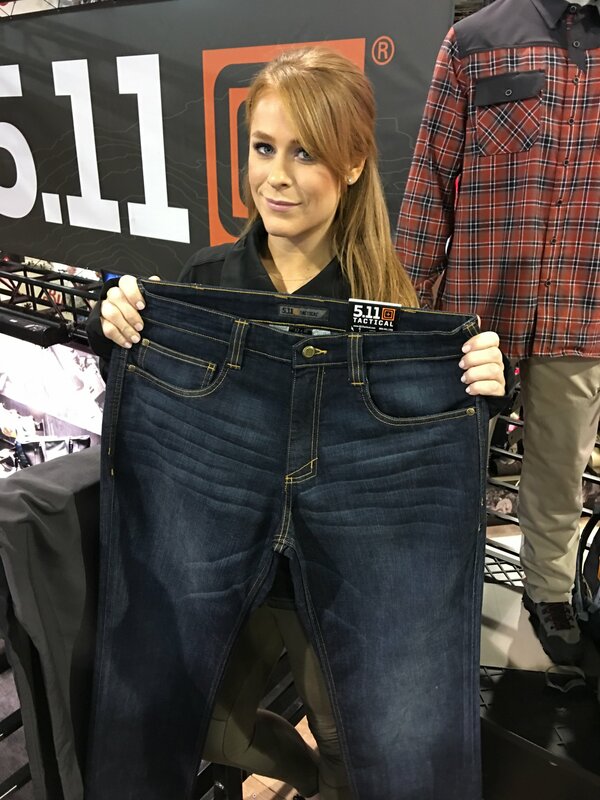 While DefenseReview (DR) was perusing the latest and greatest products at the company’s booth at SHOT Show 2017, 5.11’s Meghan Finley was kind enough to take us upstairs and show us several of them, including the 5.11 Tactical Defender-Flex Slim Jean and Straight Jean lo-pro/lo-vis stretch denim jeans, and they looked pretty damn good. The pair Meghan showed DR sported what appeared to be a medium-dark weathered wash that was quite nice looking. 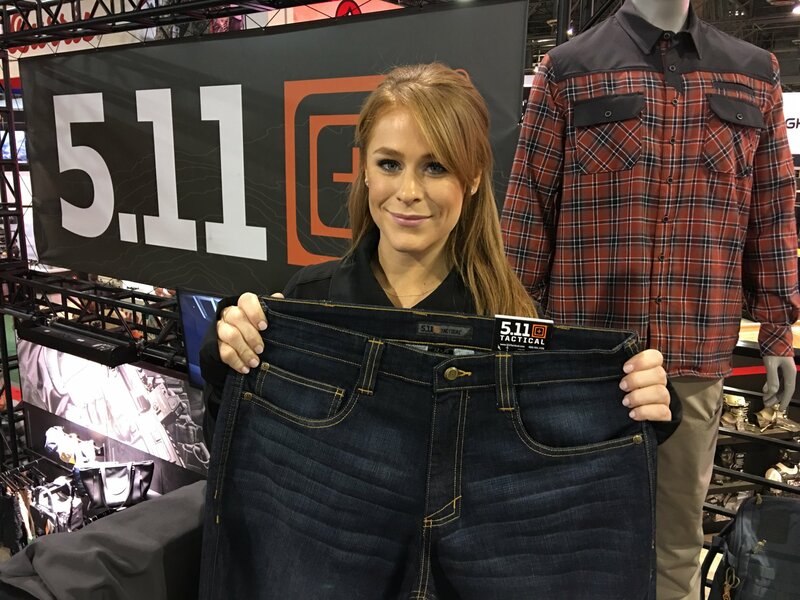 Since they’re made of stretch denim–or, more specifically, 10 oz. 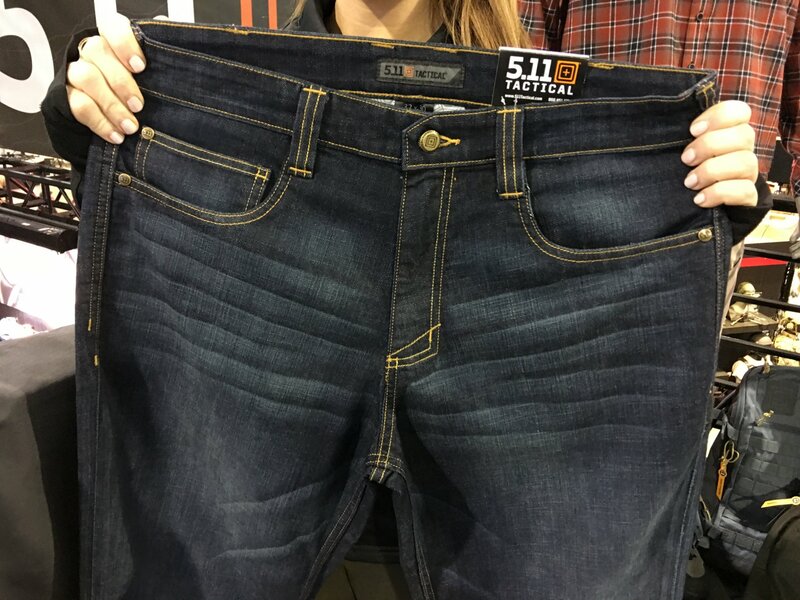 mechanical stretch denim (76% cotton / 24% polyester with Lycra® T400 Tough Max™)–the 5.11 Tactical Defender-Flex Slim Jean and 5.11 Tactical Defender-Flex Straight Jean will be very comfortable. With tactically-designed pockets galore, they’ll also be very utilitarian. 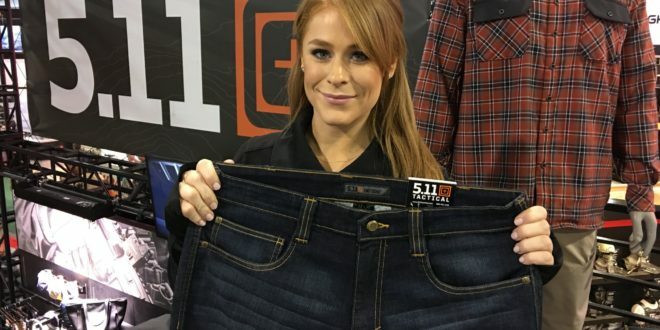 The front of the jeans provide the wearer with nice deep front pockets and an extra deep coin pocket that can fit a spare loaded pistol mag (magazine). The back of the pant gets even more interesting with two deep patch pockets and two deep hidden slit pockets above those that can fit spare loaded 5.56mm or 300 Blackout (300BLK) AR (AR-15) mags, which is a nice touch that your humble correspondent has wanted in a tactical pant for quite some time. The hidden rear pockets can of course also fit your cellphone, wallet, or other EDC (Every Day Carry) accoutrements. Stitching is done tastefully in traditional yellow. 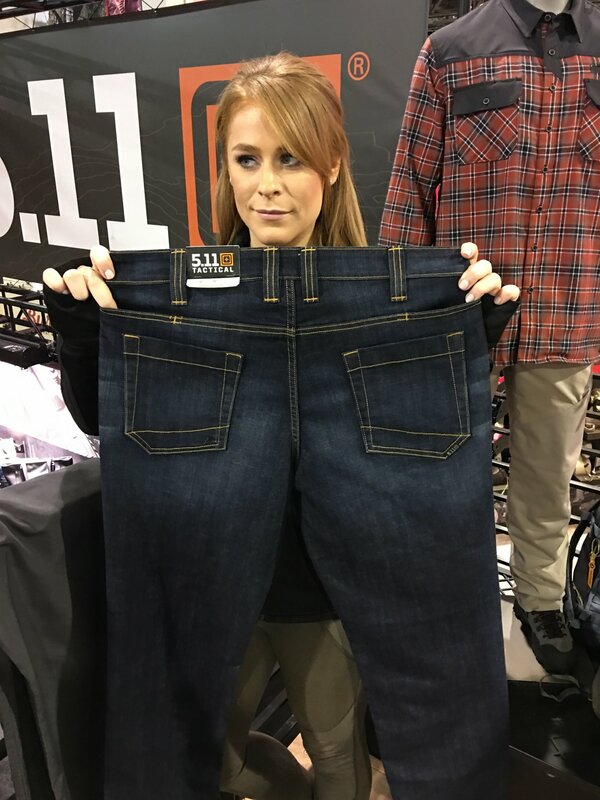 The 5.11 Tactical Defender-Flex Slim Jean and Straight Jean also feature reinforced belt loops for additional strengh and durability, and the stretch-denim provides for extra comfort when an IWB (Inside the WaistBand) holster is mounted. Comfortable, durable, functional. That’s a nice combo. Oh, and there’s also a 5.11 Tactical Defender-Flex Slim Pant in 8.8 oz. stretch Cavalry twill (66% cotton / 31% poly / 3% elastane). Hopefully, a straight-leg variant of this pant is also forthcoming soon. All of the above feature a button top fly with locking YKK® zipper, are GSA/TAA compliant, and have a current MSRP of $69.99 USD, in case you were wondering. 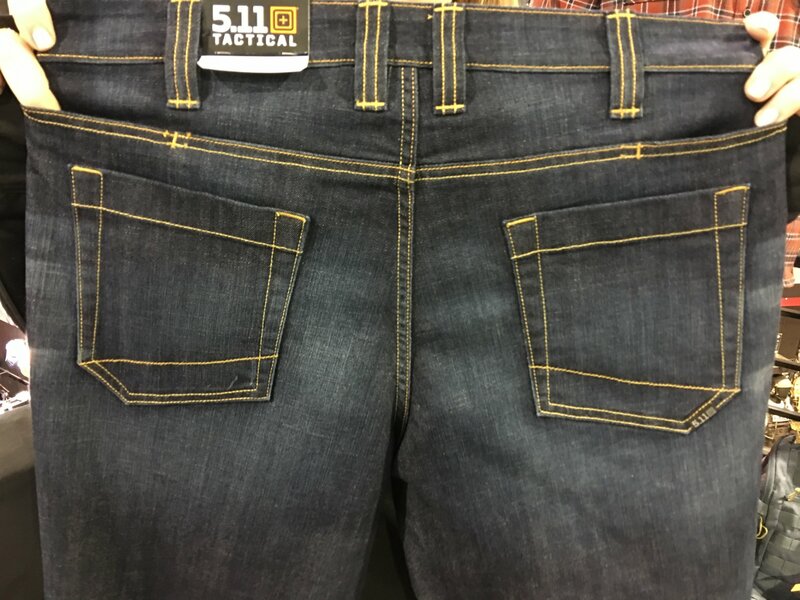 Defense Review looks forward to running a pair of the 5.11 Tactical Defender-Flex Straight Jean soon, as it’s one of the more interesting CCW-focused combat/tactical pants we’ve seen in awhile. Previous: Russian Robot Soldiers and Drone Swarms: Science Fact or Fiction? Meet FEDOR, Vikhr (‘Whirlwind’) and Smerch!